Yesterday, me, Beloved, and friends partook in an all-you-can-eat pizza promo at Leona Art Restaurant. This place located at Teacher’s Village is actually a place I’ve never heard of before until a couple of days ago when a friend linked me a picture of said promo. Since it was a pretty affordable deal, and since we were free at the time of the promo, we decided to try it out. The art cafe is located near Maginhawa street, at the corner of Matimtiman and Magiting street, just a short walk from the Ministop at Maginahawa. 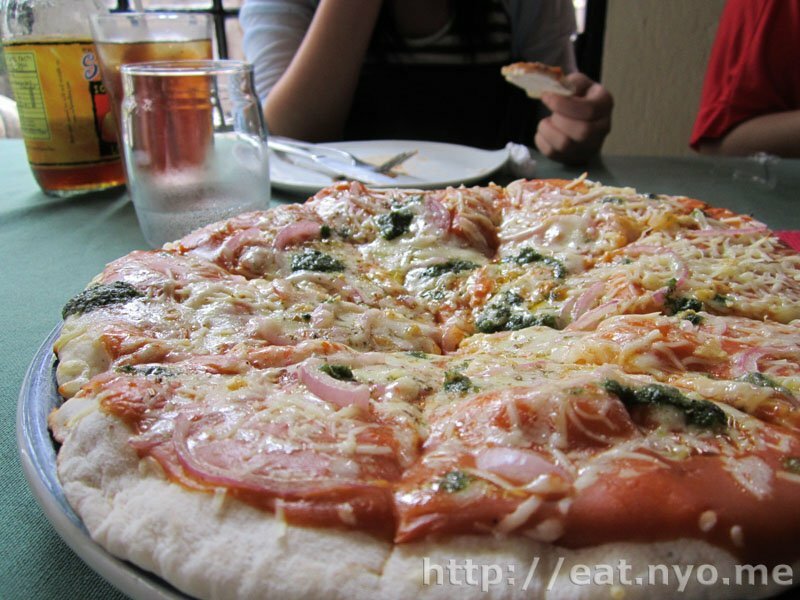 Leona offers the usual cafe food fare, and, of course, a selection of grilled pizzas in ten or fourteen inch variants. Sadly, they don’t offer all their pizzas for the promo, which is understandable because of the tag. Anyway, for 199 Php, they will serve up four of their pizzas: Three Cheese, Pepperoni, Onion and Pesto, and Hawaii, for your table to share. Three Cheese arrives first, and this was their 10 inch variant. I noticed that they put quite a lot of herbs over the cheeses. Biting in, I was content. 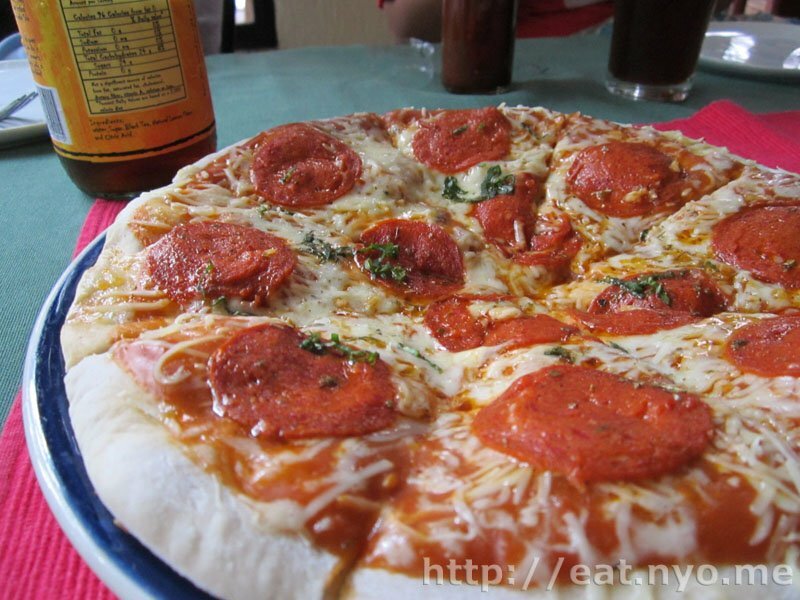 The crust is what makes this pizza pretty good. Grilled and thin, it has a nice crisp texture that I prefer. As for the cheeses, I’m certain that there’s cheddar and mozzarella in it, but I’m not certain of the third. The menu says that it’s blue cheese, but I didn’t taste any. For this promo, they substituted it for Parmesan, maybe? The sauce didn’t really make an impact over the sharp flavor of the cheddar. Second to arrive was the Pepperoni pizza. Again, I also noticed that it has the same sprinkling of herbs. The pepperoni was piping hot, but did taste as expected. Onion and Pesto arrived next. There were red onions and dabs of pesto all over the pizza. I was a bit disappointed that the pesto wasn’t spread evenly and instead done like this. However, this was personally the one I enjoyed the most due to the crunchy onions and the aromatic pesto sauce. 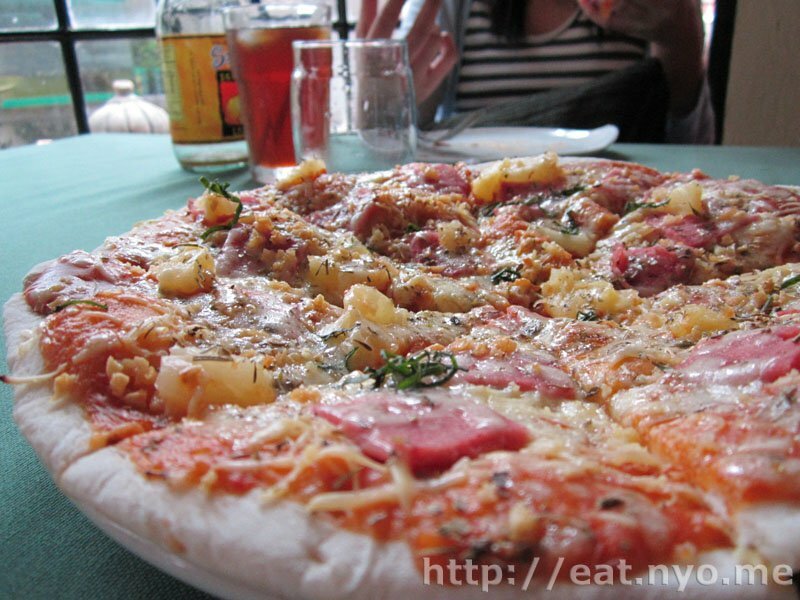 Finally, the Hawaii pizza was the expected combination of ham and pineapple, making this the sweetest of the four. Oh, and the herbs were present here as well. By the time the Hawaii pizza arrived, I was starting to get tired of the taste of sharp, rich cheese which was prominent in all the pizzas. The only thing that kept be going was the crispy thin crust and hot sauce. Overall, we managed to finish nine plates, the last five shared only by three of us, since Beloved and Hannah had to leave earlier. Not bad for what we paid for. We got what we paid for. This wasn’t the best all-you-can-eat deal we tried, mainly because the base sauce and cheese of the pizzas were similar and very easy to tire of. However, we practically doubled up on what we’re supposed to get for what we paid, albeit for a more limited selection. The all-you-can-eat pizza at Leona Art Restaurant was worth the try, but I certainly won’t be having pizza or anything with lots of cheddar for a while. Location: Matimtiman corner Magiting street, UP Teacher’s Village, near Maginhawa. 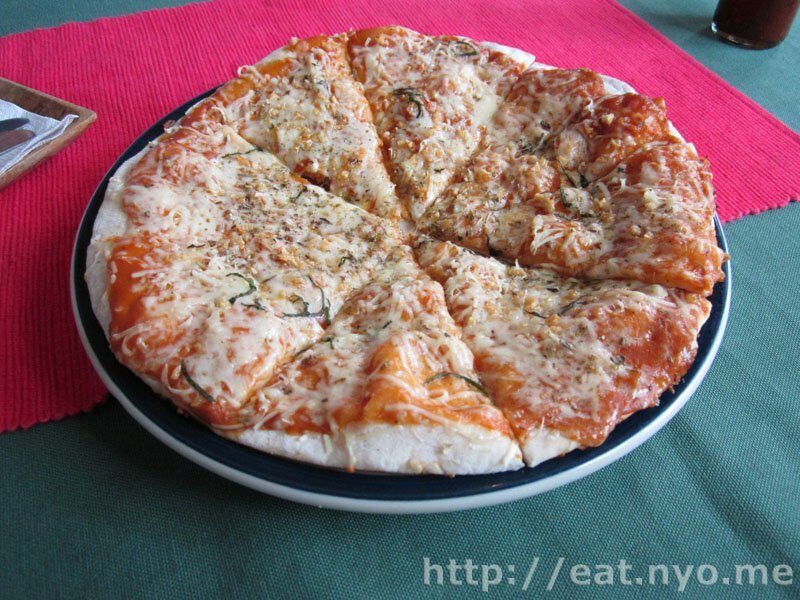 Recommended for: Cheddar cheese and thin crust lovers. Not recommended for: Pizza haters. Smart nomnomnom tip: If ordering Ala-carte, the ten inch pizzas are good for two.